AB=CD is a reversal pattern that helps you identify when the price is about to change direction. The idea is that you can buy when prices are low and about to rise, or sell when they are high but about to fall. The AB=CD pattern helps you identify when price is about to change direction so that you can buy when prices are low and sell when they are high. The pattern consists of three legs, with two equal legs labelled AB and CD, together they form a zig-zag shape. For this reason it is sometimes called the 'lightning bolt pattern'. 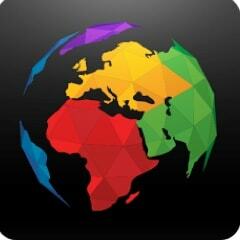 It can be used in any financial market and on any time frame. 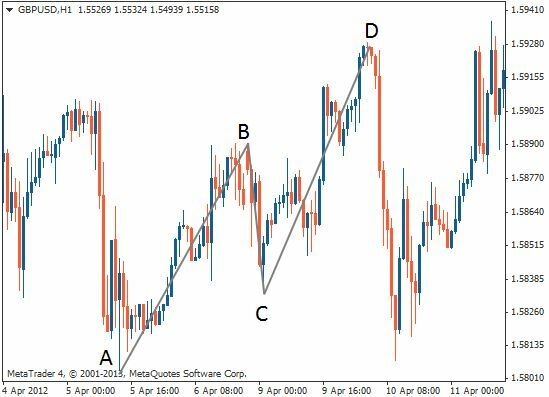 As shown below, when a market is trending upwards, the first leg (A-B) is formed as the price rises from A to B. At point B the price switches direction and retraces down sharply to form the B-C leg. The retracement (from B to C) can be between 38.2% to 78.6% of the A-B leg, however, an ideal pattern has a retracement of 61.8% to 78.6%. We will use Fibonacci at this point later on. At point C, the price switches direction again and continues its original uptrend. This leg (C-D) slopes upwards, parallel with the A-B leg and should ideally be the same length as the A-B leg when it completes. The ideal AB=CD pattern is equal in time and price, with point D being an Fibonacci extension between 127%-161.8% of the B-C leg. You can sell at point D (or just before) where the pattern ends, or, in a downtrending market, go long at point D.
After you have identified the pattern, you can then start to look for a trading opportunity at point D.
For our example, we will use an up-trending pattern that you would use to place a bearish (sell) trade. You would approach a down trending market with a bullish (buy) trade in exactly the same way, by simply inverting the pattern and your trading orders. 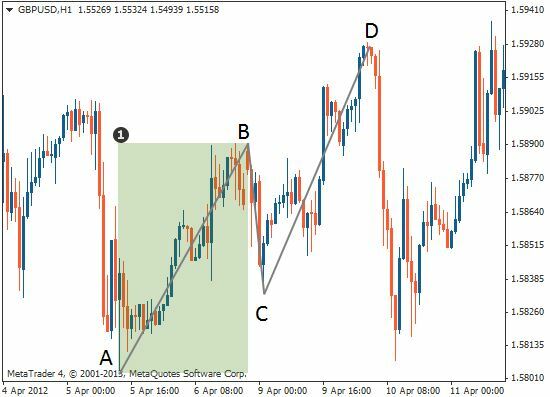 To make a sell trade in an up-trending AB=CD pattern, Place a sell order at point D. Place your stop loss a few pips above that point. Once D is reached, draw a new Fibonacci retracement from point A to D of the pattern, place your take profit at the 38.2%-61.8% Fibonacci levels. The first step is to identify point D where the pattern will complete and place your entry there. Place your stop loss just a few pips above point D. This is because if the C-D leg ends up extending beyond this point, it will usually then continue much further in this direction. 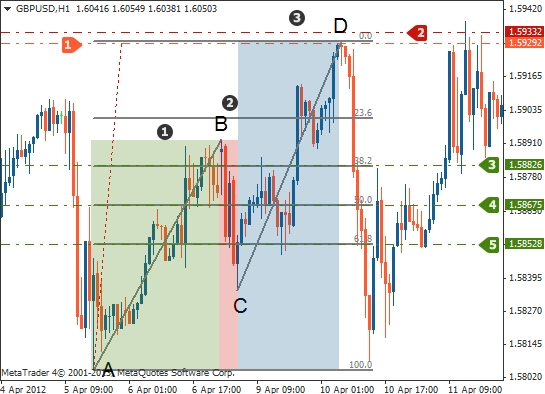 One way of deciding where to take profits is by drawing a new Fibonacci retracement from point A to D of the pattern. Note that you can only do this once the D point has already been reached and the original pattern has completed. You can place your take profit order at the 38.2%, 50.0% and 61.8% levels. If you are unsure of which one to place your take profit at, then you can simply place the profit target at the 61.8% level, but watch closely how the price reacts around the levels. If the price struggles to break through any one of them, then you can close your trade down and take profit early. Take profit option 1 at the 38.2% Fibonacci retracement. 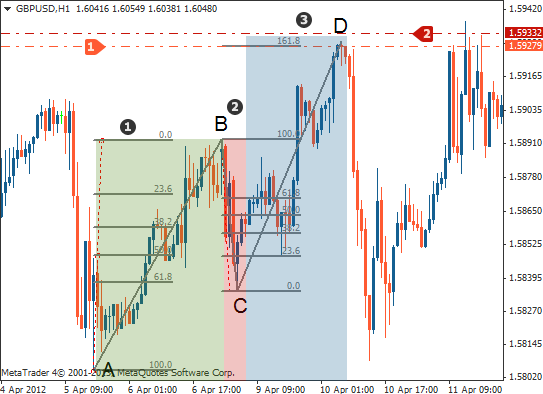 Take profit option 2 at the 50.0% Fibonacci retracement. 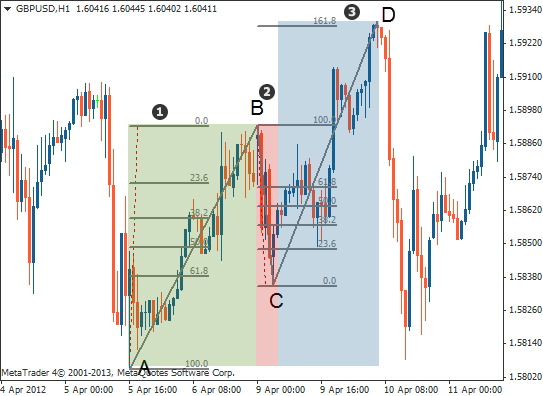 Take profit option 3 at the 61.8% Fibonacci retracement. … the AB=CD pattern helps you identify when a price is about to change direction so that you can buy when prices are low and sell when they are high. … the pattern consists of three legs, with two equal legs labelled AB and CD, together they form a zig-zag shape – hence its nickname, the 'lightning bolt'. 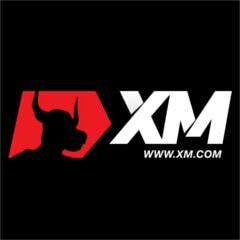 … it can be used in any financial market and on any time frame. … when a market is trending upwards, the first leg (A-B) is formed as the price rises from A to B. … at point B, the price switches direction and retraces down sharply to form the B-C leg – ideally a 61.8% or 78.6% retracement of the price increase between points A and B. … the price then continues its original uptrend, forming a C-D leg that should be the same length as the A-B leg. … once you have decided where you think the pattern will complete (point D), you should place a sell order at this point and look to profit from a price reversal. 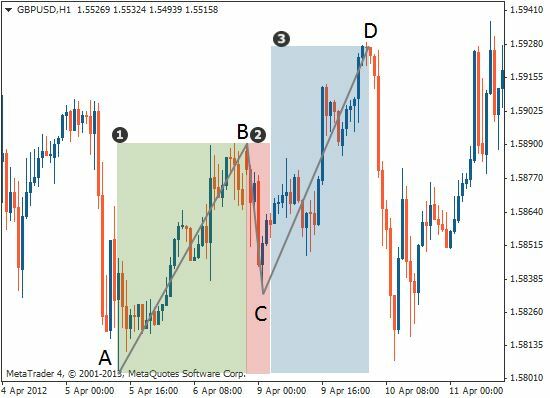 … place your stop loss a few pips above point D.
… Drawing a new Fibonacci retracement from point A to D of the completed pattern and a take profit at the point where the price will have retraced 61.8% of the distance between A and D.
… you would approach a downtrending market with a bullish (buy) trade at point D in exactly the same way – the pattern and your trading orders will simply be reversed.